On 1st July 2015, a couple of weeks after the doors were opened, Magic Rock Brewery held the official launch party for their new tap room and this was an invitation I simply could not pass up. 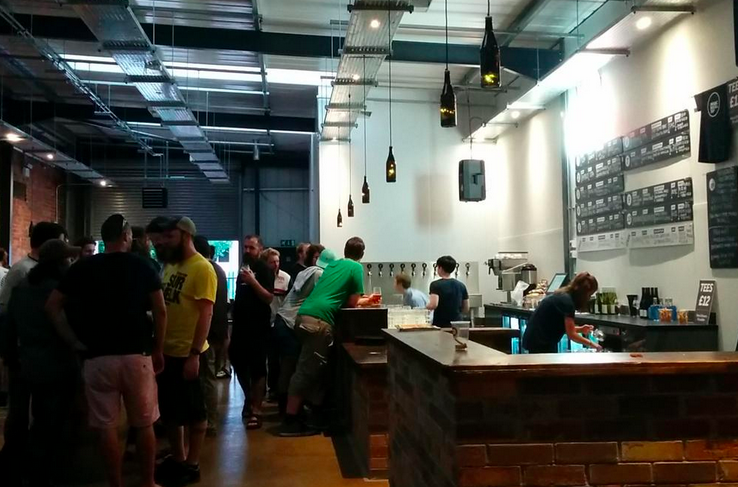 The impressive venue adjoins their vastly expanded new brew house in Birkby, Huddersfield. The brewery itself is entering the final stages of build out, with brewing operations expected to commence in the next few weeks. The tap however is already in full swing and provides a literal window into what will mark a huge step up in capacity once fully operational. It was the hottest July day on record and having endured a marathon drive up thanks to the M1 being partially closed, all I could think about on arrival was liquid refreshment of the coldest kind. I just about managed to resist the immediate lure of Andy Annat's fantastic Cracker Jack BBQ and make my way inside to the bar. Moments later, with a cold glass of Cannonball helping to cool my addled brain, a wave of familiarity washed over me - and this was not induced by the sight of the many familiar faces. The feeling of walking from searing heat into a cool bar, the delicious aromas of smoked meat wafting in on the breeze and the hop flavours washing over my palate transported me to somewhere I love to visit and a place that's the source of my most memorable and inspirational beery adventures - San Diego, California. Even taking away the uncharacteristic California-like heat of that summer's evening, the bar itself takes a lot from the visual traits of brewery taps of craft beer giants such as Stone and Green Flash and lesser known names such as Societe and Saint Archer. Beyond the industrial feel, the artwork adorning the walls, the sparkle of keg taps under the bright lights, the giant glass windows exposing the source of the beers or the laid back blues music, the Magic Rock Tap just has that certain something - and it obviously runs much deeper than just copycat design and a desire to mimic those arguably seen as craft brewing's finest. Magic Rock was born out of MD Richard Burhouse's love of the brewing and tap room culture of the west coast and of course inspired by the beer styles those breweries are seen to represent. Sitting in a quiet corner and reflecting later in the evening, I wondered if every day of the four years since their launch at The Grove in June 2011 had somehow been building up to this second, more significant launch - was this the day Magic Rock moved beyond being inspired by that culture and into fully living and breathing it? Into being the source of such inspiration for future breweries?